Rainier, DC, my daughter's college graduation climb, July 19 . 13 years since I summitted Rainier, I'm overdue. - Temple Crag - Sill traverse, Palisades, Sierras. Washington Pass outing, August 8-11: 3 days of multipitch climbing in the Libery Bell group, Wine Spires, and Kangaroo Temple. See routelist for route options. Chimney Rock East Face Direct, 5.6, 7p (3 5th-class, the rest 3rd and 4th) I'd like to try traversing off to the SW on the descent, exploring a small part of my "21 peaks" ridge traverse project (below). OK, I'd just like to get the route done on this "man-mountain"! Rainier, Kautz Glacier. 10 years since I summitted Rainier, I'm overdue. My new dream (nightmare?) project: "21-Peak Salute"! Need to try Shasta Hotlum-Boland again - or maybe Hotlum-Wintun Ridge, I hear it's a bit more ski-friendly direct route to the summit. 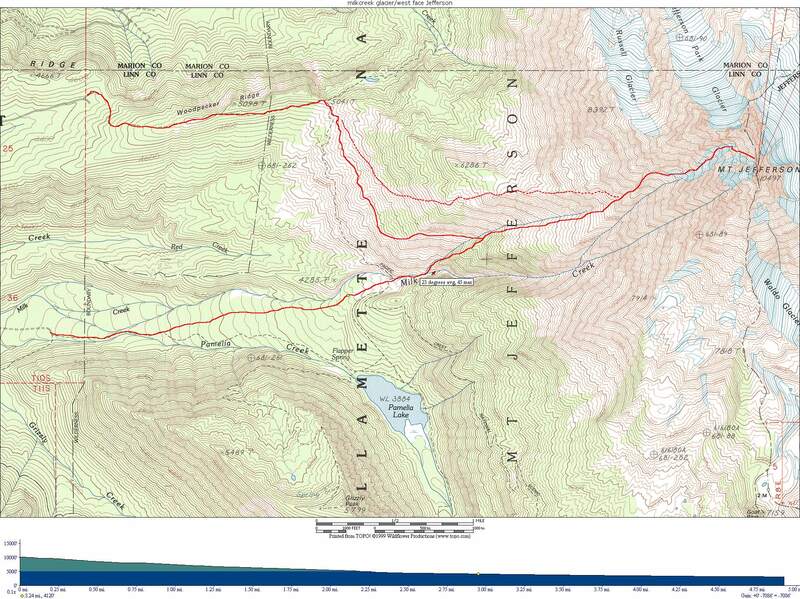 Jefferson Milk Creek Gully - continuous 600 foot, avg 25, max 45 degree descent, short approach! (At least so it appears on the topo.) Looks like a good June trip for intermediate+ skiers. I talked to a guy recently who loves it and has skiied it 6 times! Sine I summitted last year, I'm likely interested in skipping the summit pinnacle, so we could go light without climbing gear just for the ski descent. Must be done early-season. St. Helens, Worm Flows ski descent. That is, as soon as they let us on the mountain again to look at the new, growing lava dome! Royal Basin/the Needles in the Olympics - a nice base camp surrounded by a dozen rock climbs to 5.7, mostly arrayed along the ridges above the bowl - including Mts. Deception, Martin, Johnson, and Clark, the Incisor, Gasp, Sweat, Arrowhead pinnacles, etc. - the best collection of easy rock climbs in the Olympics, it seems. There seems to be a straighforward ridge loop that would hit most of the major peaks. I exhumed this from the Olympic Mountains Climber's guide I picked up at a garage sale of a recently deceased old climber (natural causes), along with copies of Nick Dodge and the second Ballantine edition of Tom Hornbein's Everest: the West Ridge. Wine Spires - good 5.8 multi-pitch climbs near North Cascades Highway. One of the long 5.7/5.8 routes on Dragontail: possibly NW Buttress, which is very long, or the Serpentine Arete: sound rock to 5.8, continuously steep. Mt. Slesse, NW Buttress - another 50-classics route. Mt Ruth - a recommended easy N. Cascades ski tour, fabulous views of dozens of peaks. Sahalie - the classic N. Cascades ski ascent. Mt. Daniel - ski or not: supposedly it's a good ski tour. A longer list of objectives.